How Mobile-Friendly is Your Classroom? For generations, the main areas of learning in the classroom have been the same. Reading, Writing, Math, Science, and Social Studies. These “core” subject areas of curriculum have been a focus of American learners since the mid-20th century. These subject areas were thought to be the essential curriculum necessary to prepare the youth for success in college and the workplace. The manner in which these subject areas were taught mirrored the factory model method in which they were delivered. Content was passed back, row-by-row, as students repeated tasks and built skills over time. While both traditional teaching styles and core subject areas have been slow to change to the modern world, the new area of mobile devices in classrooms is disrupting all of our previous ideologies around these sacred pillars of education. Repetitive tasks can now be gamified into forms that create critical thinking. Fact-based content can now easily be searched, opening up time to work on association and application of that information. Science and Math have given way to STEM. Reading and writing are now being embedded throughout the curriculum in a more project-based approach. As these changes collide in a classroom that now welcome mobile devices, the modern teacher needs to think about how this affects change in their classroom in multiple areas. In Book #4 of the Mobile Learning Mindset, I represent this transition in a concept I call the Mobile Learning Quadrant (MLQ). While much of the content in education is still based on the core subject areas (driven mostly by traditionalism and standardized testing), it now begins to take on a much more interactive form with mobile devices. Initial iterations of content on mobile devices meant glorified PDFs in the form of online textbooks. Still, at the beginning, mobile learning meant consuming content on a screen rather than in a book. In the new mobile learning environment, content must shift from consumption to creation. Rather than reading the textbook online, students can create their own textbook to demonstrate learning. The days of having desks in rows are over. 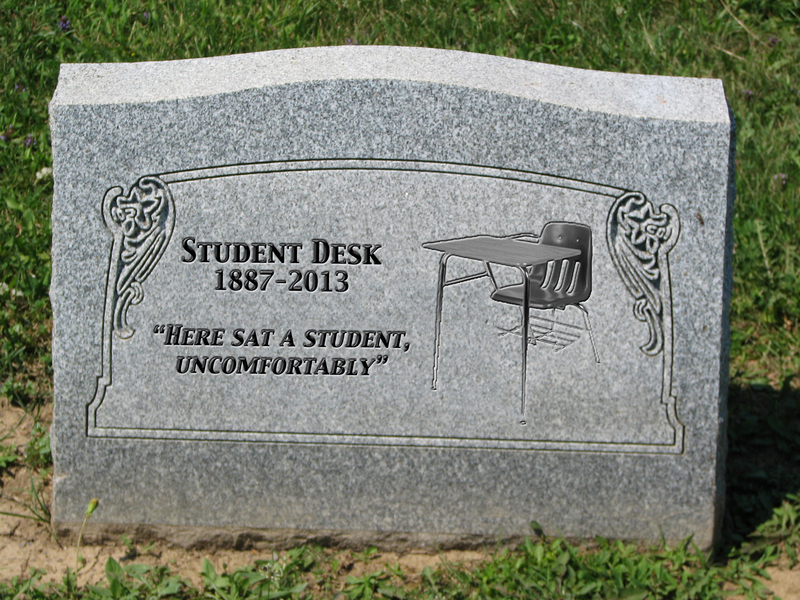 It’s time to write an obituary to the student desk. Obviously the word “mobile” applies to much more than just devices. However, in many classrooms this isn’t the case. Devices are distributed to engage learners, yet really all they do is replace their paper notebook as students sit in rows and take notes on their Chromebooks. The mobile learning environment should contain flexible spaces that encourage interaction and collaboration with others in the room and online. It doesn’t always have to be an expensive new modern chair either. Many teachers are hacking their spaces with bean bag chairs, exercise balls and pub tables. Learning doesn’t even have to be contained within the classroom walls anymore. Teachers assessing their space in the MLQ should determine how much of their students’ time is spent in static spaces versus dynamic ones. A sneak peak at our new Incubator room at Westlake High School. Purposeful and mobile furniture. With more flexible space comes more meaningful interaction amongst students. When I took part in the #Student4aDay Challenge, in the classrooms where the space was static, there was little to know interaction between student to student. In fact, most of the interaction was uni-directional (teacher to student). However, in the classrooms with more flexible space and student created content, interaction becomes much more collaborative in nature rather than isolated. All of the above quadrants can still happen without technology or mobile devices. While mobile devices make them all much more possible and dynamic, much of it depends on how the teacher integrates them. The ability to shift learning from a set-time every day to more on-demand can only happen with technology. Remember only a couple of decades ago when in order to watch the next great episode of the Facts of Life, it meant that you had to sit in front of the television at 7:30 on Thursday night? If you missed it, you missed it. In our schools you could apply that same rule to the class schedule. If you are the type of person that learns math best in the afternoon but have to take math at 9:30 in the morning, you also “miss” it. Now with flipped classrooms and blended learning in a mobile environment, we can “bend” time to make the necessary content much more available on demand. Infusing mobile learning into a classroom where students consume content in isolation in a desk at a set time of day is a waste in some ways. Creating flexible spaces that encourage collaboration to create content and an environment where learning can happen 24/7 is truly a thing to behold. Leveraging the MLQ in this way can really begin to move the needle when it comes to efficiency of learning with mobile devices. Editor’s note: This post is based on the book series Mobile Learning Mindset. This 6-book series explores how each key stakeholder can best support a mobile learning initiative. The first two books are already out and can be purchased here. Books 3 (focused on coaches and professional learning) and book 4 (focused on the teacher and classroom environment) are set to be published at the end of September. Student Desks had a rich history in public education. Descended from its “parent” Anna Breadin, who is credited with “birthing” (designing and patenting) the student desk in the late 1880’s, the Student Desk really found a moment of growth and boom during the 1940’s. In this Industrial Age, when the need to put things in neat rows was prevalent, learning needed to take place in much the same way as factory assembly lines. Why would students need to move around the classroom? The only time students needed to move was to go to the bathroom and you better really had to go because it entailed carrying around a large wooden keychain that said, “Hall Pass”. Much like the ballyhooed and unrelated bell curve chart, it seemed that the Student Desk’s middle age was a time of great dominance in the classroom of America. The Student Desk had a life-long fascination with putting students’ rear-ends to sleep, a trait it mastered by the mid-1950’s. The 50’s were a time of transformation for the Student Desk’s life as it became a tool for protecting students during the “Duck and cover” days of cold war-era America. The Student Desk came in all shapes in sizes, especially by the 1960’s, a time of cultural change in our country. Tie-dye models and desks made from hemp would be built and later destroyed during this time, but one thing remained constant – their severe lack of mobility and comfort. Despite these rough times, the Student Desk maintained its dominance in the American school system. Indeed, it seemed like nothing could stop the proliferation of the standard Student Desk in our school systems until the dreaded 2010’s. This was the beginning of the end for the Student Desk. This dark time in the Desk’s life began innocently enough. Schools were looking for ways to get more access to learning in the hands of kids. While this seemed like a novel idea to the Desk, one that would pass in time (like those 1:1 Lava Lamp days of 1968-69), this concept seemed to have staying power. The last few years of the Desk’s life would be a blur. Students began to come to class with some smartphone thingy and schools were even issuing tablets to kids. The Student Desk was no longer needed for physical support as it was in the past. As preposterous as it sounds, this new idea of learning with mobile devices also meant that the Desk’s other primary strength (its ability to create neat rows) was no longer a necessity. Students needed to be able to move around and work in a variety of ways; individually, in small groups, or as a whole. The teacher no longer need to relay information down the rows, instead learning could happen anywhere and everywhere in the classroom. Depressed and no longer needed, the Student Desk ended its life by throwing itself into a giant wood-chipper behind the school. The Desk is survived by aged relatives like the pencil, the paper notebook, daylight savings time, and as of this writing, the paper textbook (which is currently on life-support in a Santa Monica area hospital). In lieu of flowers the Desk asks that you plant a tree in its honor for the wood that was used to make the desk and offer a donation to the Chiropractors Helping Ailing Inflamed Rears Society (C.H.A.I.R.S.). Finally, the family asks that in honor of the Student Desk that you write your school board and administration to rid classrooms of its kind. It’s time to move on people. For more in depth ideas of what the classroom sans Student Desk looks like, see this post on the BPE Bobcat blog. Also see pictures below classrooms by two Bridge Point elementary teachers and watch this news clip recently released following the demise of the Student Desk.